On August 18, 1846, Company B of the 1st United States Dragoons participated in the bloodless conquest of Santa Fe. Brig. General Stephen W. Kearny, with orders to proceed to California, broke up Company B and transferred most of its enlisted men and mounts to the other four companies of Dragoons and headed west. Lt. John Love, now in field command of Company B, was ordered to return East to gather recruits. While Lt. Love was slowly gaining recruits for Company B in Ohio and Indiana, he received the following letter from Lt. Henry Stanton, the regimental adjutant. The letter is significant in two regards. First, it reveals that the new Grimsley horse equipage was being widely issued, prior to its official adoption by the Army board in 1848. Second, the letter tells of a November 12, 1846, running battle between elements of the 1st Dragoons and the Navajo. Although the Dragoons had patrolled the plains since 1833, this encounter was the first reported skirmish between the Dragoons and Native Americans and occurred nearly a month prior to the bloody clash between Company C and Californio militia near the village of San Pascual, California. If you should want any horse equipage I have receipted for a good deal of New Equipage that was sent on for the different Dragoon Companies, and which has never been used, and if you are not able to equip you Company entirely at St. Louis, I may be able to help you. Colonel Wharton has at last indirectly applied to join the Army in the field, he will probably get an answer before the middle of next month. We got a mail from Santa Fe a day or two ago. Grier had a fight with the Indians, it seems they have runned [sic] off some cattle, Grier followed them, but owing to the bad condition of the mules of his party, only himself, Lieut. Wilson and two men were able to come up with the Indians; they killed two of the Indians and Grier’s horse or mule whatever it was, shot [out from] under him. 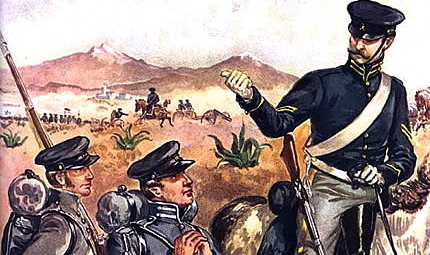 The Dragoons under Burgwin have been ordered to the Passo [El Paso] to protect the traders. He writes very despondently, says, if his men were only Dragoons he might do something. I hope that Colonel Wharton joins [Generals] Scott or Taylor that he will [have] some more Companies of the 1st Dragoons down with him. If he could get four or five Companies it would be a very pretty command. How are you getting along at Dayton. Did the Girls give you a warm welcome? I was not able to send you a copy of your estimate for clothing because by some mistake it was sent off without a copy being attached. If there should by any possibility be any thing new here, I will [sic] let you know. An account of Lt. Grier’s battle with the Navajos appears in Lt. Col. W.H. Military Reconnaissance, Ex. Doc. No. 41, 1848, Report of Lt. J. W. Abert, 498.
of sheep the Indians were yet driving. off a coat button, and lodged in the saddle blanket of Captain Grier. Fort Leavenworth December 21, 1846. “tomorrow I start on an expedition to the south. I have (at Albuquerque) a solitary [[garbled–best guess]] squadron of 175 men. I would feel perfectly satisfied with my situation, were not my command so truly ineffectual [[this is a complaint about the squadron being mounted on the worst of the dragoons’ mules, not about the quality of his dragoons– and soon this, the squadron was completely dismounted]]. All our horses, you know, have been sent to Missouri, under the belief that they could not sustain the fatigues, and no forage, of the march to California. When the detachment for the march was finally made up at Socorro, all of the really serviceable mules were selected for it, out of the companies that were to remain in this country – so that now I have not only for my mounts, but for my teams, the sorriest lot of animals that were ever seen. I had the greatest difficulty in performing the march back to this place, and now find myself with scarce the ability to move from it. I received today a call upon me, which demands prompt attention, and which requires the exertions of my utmost ability. After pacification of the country, the Chihuahua traders continued their journey towards the south, in order that they might avail themselves of the operations of General Wool’s army, for the entrance of their goods into California. “It seems that some had trusted too far to the peaceful professions of the Mexicans. They have all halted about one hundred and fifty miles from here, and having good reasons, they say, to believe that the Mexicans from the settlements of El Passo, design making the attack on them, for plunder, have written up for troops to protect them. The value of their property is estimated at a half million of dollars. Although these traders have by their own imprudence placed themselves in this danger, yet the protection of so many American lives, and of so large an amount of American property, is a matter of great importance; and I feel it incumbent on me, feeble and small as is my force, to make an effort to accomplish it. What would I not give to have with me a squadron of dragoons! [[again, a complaint about mounts, not soldiers]] Since receiving the letter from the traders, I have received letters from Gov. Bent, the intelligence communicated in which tends to confirm the impression that there is a very general feeling of discontent existing among the people of the province, and that efforts have been made to get up an opposition towards us, the first development of which is to be an attack on the traders below. It is said that a force of one thousand men has been assembled at El Passo del Norte, to act in concert with the people above in this business. If this should be, or could out approach for the protection of the traders by unknown to them, we may yet have the satisfaction and enjoyment of a battle with these people. 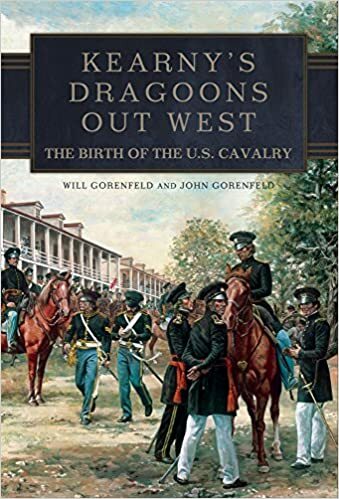 Of the fatigues and hardships of a quasi war the 1st dragoons have had enough, but we cannot boast the honor of having been in a stricken field. Henry Stanton would serve as regimental adjutant at Fort Leavenworth and Jefferson Barracks until 1851. Gaining a Captain’s commission in 1854, he was placed in command of John Love’s old Company B. In January of 1855, Company B took part in an expedition against the Mescalero Apache, south of Sierra Blanca in the Sacramento Mountains of New Mexico Territory. Captain Stanton forgot all about Captain Grier’s near fatal mistake of riding too far in advance of his support. While rashly leading a small detachment in pursuit of a fleeing band of Mescaleros, Captain Stanton and three troopers were ambushed and killed. In 1846, the Ringgold saddle was the official saddle for the mounted arm. It was not until March 7, 1848, that an Army board approved the Grimsley saddle as the official pattern. (Stephen Dorsey & Kenneth McPheeters, The American Military Saddle 1776-1945 (Collectors—™ Library, Eugene, Ore. 1999), 20. The original of this letter may be found at the Indiana Historical Society in Indianapolis. The author wises to express his deep appreciation to Mrs. Besty Caldwell for making a copy of this letter available. German-born First Sergeant Frederick Muller had been with the Dragoons since 1834. He was thirty-five years of age and was six foot-one inch in height. Lt. Love wrote of Muller that, —œwhether in battle, in camp, or on the march, he is energetic and soldierly; never in one instance have I known him to neglect his duty.— Sergeant Muller donned the scarlet trimmed jacket of an Ordnance Sergeant. He served in this capacity until his death in 1861 at Fort Wood in New York harbor. (Report of John Love, House Ex. Docs., 30 Cong., 1 sess., No. 1, 120.; (War Department Files, National Archives, Lt. John Love’s Company B, Muster Roll Records, 28 February to 30 April, 1847. (Hereafter, Muster Roll)..
Trooper John F. Nickerson enlisted in the 1st Dragoons in 1841. Promoted to the rank of corporal in June of 1847, on February 6, 1848, he received a surgeon—™s discharge. (Muster Roll, Company B, 1 January to 28 February, 1848.). Lt. Col. Clifton Wharton. 1st Dragoons (Heitman, 1022). During the most of Mexican War, there was lively trade between American merchants in Santa Fe and Mexican merchants in Chihuahua. (See generally, Edward James Glasgow and William Henry Glasgow, Brothers on the Santa Fe and Chihuahua Trails, edited by Mark L. Gardner (Niwest, Colo, Univ. Colorado Press 1993). Capt. Richard Ewell to Lt. William Nichols, 10 February 1855, Letters Received, Department of New Mexico, Record Group 393, Microfilm 1120, Roll 4, National Archives. Lenoir Family Papers, #2262, Southern Historical Collection, The Wilson Library, University of North Carolina at Chapel Hill. Courtesy of Tim Kimball.